We have uploaded another presentation for Plenary Session -2. Please click here to view all Plenary and Panel session presentations. We have uploaded another presentation for Plenary Session -3. Please click here to view all Plenary and Panel session presentations. Thank you for your participation in ICAPP2017! We have uploaded presentations of the Plenary Sessions (ID/password required). Please click here to access the presentations. Furthermore, young generation researchers were awarded. Registration Hours and the ICAPP 2017 Program Book (PDF Version) have been updated. The pre-registration has closed. If you wish to attend the conference, please come to the On-site Registration Desk at the venue (Fukui or Kyoto). Instructions for Speakers and Chairs have been uploaded. We kindly ask all speakers and chairs to carefully read the instructions. The Preliminary Technical Sessions Program has been uploaded. Pre-registration for the Early-Fee has ended. Details of the Preliminary Program have been updated. All speakers and chairs must participate in the Speakers Breakfasts on the day of their assigned slot. Please check out the extended deadlines for the special group rate regarding hotel bookings. Preliminary Program has been updated. Program and Greeting / Organization, Registration/Accommodation have been updated. The registration for Fukui Open Session has opened. The Declaration of Copyright Transfer has been uploaded. Review Notification (December 24 January 20, 2017) and Final Paper/Copy right deadline (January 31 February 17, 2017) have been extended. Program and Call For Papers have been updated. Further details regarding the presentation policy are online now. Program, Call For Papers, Tours/Social Events have been updated. The registration for ICAPP2017 has opened. Abstract submission has been closed. If you have any inquiries, please contact the secretariat. Abstract submission deadline has been furthermore extended (October 7 October 21, 2016). We are still accepting abstract submissions. Due to the start of the reviewing process (Sep. 26), no more corrections or alterations are possible. Call For Papers and Registration/Accommodation have been updated. Abstract submission deadline has been extended (October 7 October 21, 2016). We are still accepting abstract submissions. Due to the start of the reviewing process (Sep. 26), no more corrections or alterations are possible. Greeting / Organization, Sponsorship, Venues / Travel, Tours/Social Events have been updated. The International Congress on Advances in Nuclear Power Plants (ICAPP) provides a forum for leaders of the nuclear industry to exchange information, present results from their work, review the state of the industry, and discuss future directions and needs for the deployment of new nuclear power plant systems around the world. ICAPP will gather industry leaders in several invited lectures in plenary sessions. 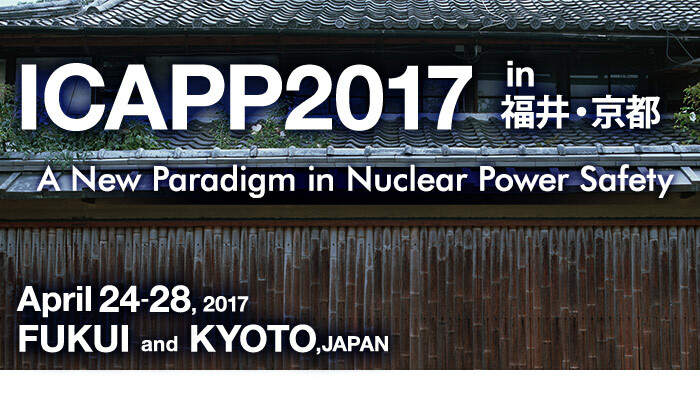 The theme for ICAPP2017 is A New Paradigm in Nuclear Power Safety. Since the Fukushima Daiichi Accident in 2011, various efforts in improving nuclear safety have been initiated not only in Japan but also in other countries. Decontamination of affected soil and steps toward decommissioning Fukushima Daiichi are proceeding steadily, but many issues to be resolved still remain. Further advances in reactor decommissioning technologies are expected in light of the rising number of old nuclear power plants being closed. The congress also provides an excellent opportunity to discuss these topics. ICAPP is an annual event, cosponsored by AESJ, ANS, KNS, SFEN, and a number of major international nuclear societies, and is held in cooperation with the International Atomic Energy Agency. Since its inception in 2002, ICAPP has been held biannually in the USA, and in Europe and Asia during the years in between. Kindly supported by the Foundation Fukui Convention & Visitors Bureau. Copyright © ICAPP2017. All Rights Reserved.